I haven't really been a dedicated knitter this summer. Much of my knitting time during the school year is while on public transit or sitting through seminars. I've been riding an e-bike around since March, and so have only had to take transit a few times, and the seminars are much less plentiful during the summer. Still, I've managed to complete a few projects over the last few months while watching TV shows with the boyfriend, or during a much-needed break from coding or paper-writing. Here are five projects that I've neglected to write about over the summer. Besides the wedding knitting from the previous post, I've mostly been working on small quick projects because I haven't had the attention span for much else. One of these, my Jayne Hat from the show Firefly, I actually finished in just one day in March. I used the Knitting Ninja Edition of this pattern by Allison MacAlister. The yarn is Cascade 220 held double, and I still have enough yarn to make another one, so that's totally happening. This is the first hat I've made that the boyfriend would actually be happy to wear, so I'll have one for each of us! How cute! Next, these socks, which I actually finished in December, but never got around to blogging about. They're simple toe-up, short-row heel, knee-high socks with calf shaping, using the same basic pattern as for my Lightning Socks. The yarn is Knit Picks Felici in the colourway Botany (now unfortunately discontinued), which is quite lovely and soft. After knitting those Mario Mushroom Mitts for Ellie, I figured I was capable of making some gloves without a pattern, and believe it or not, I succeeded! I used the leftover yarn from those mitts, and then, of course, ran out of yarn, so I had to finish the fingers on the second glove with something else... figures. Anyway, I didn't let it phase me too much, and I'm calling them my patchwork gloves. For Christmas, Joanna had given me a couple of her knitting kits, and I finally got around to knitting one of them in February (ok, still not summer, but I hadn't gotten around to writing about that either). 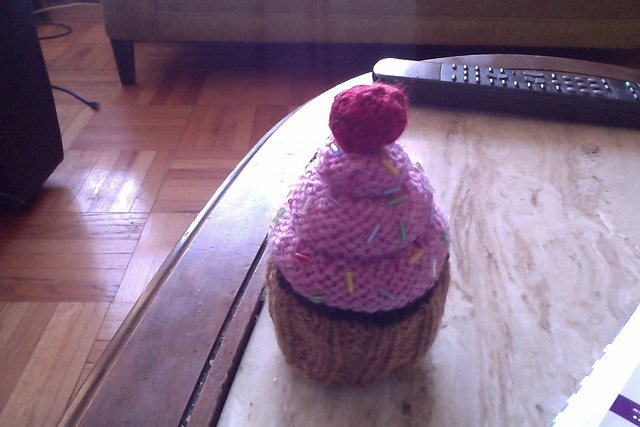 This was one of her cupcakes from the Cherry on Top pattern. It's actually a whole lot simpler than it looks, and the entire thing is knit in one piece, except for the cherry on top. It only took me a day to make. Mine is a chocolate cupcake with strawberry frosting! Finally, another pair of socks that I really enjoyed knitting. I'm always interested in interesting sock construction, and when I saw the Carousel Socks by Louise Robert, I knew I had to make them. I also just happened to have the perfect yarn from my recent Etsy purchase! The colour changes in Green Progressions Dye's End worked perfectly with this pattern. I think if I were to do it again, however, I'd try to modify them with calf increases so I could have knee socks. And now I've finally caught you up on all my finished projects! Next time, some adventures in dying (the good kind)! care to share what colors you used for the jayne hat, please? Yours are the closest I've seen so far to the original! Well done!